John is a Columbus, Ohio native, the leads his business with his commitment to God and his family as his first priority. He has been a loving husband to wife, Sherri, since 2005, and they have 6 children, and 2 grandchildren. Wilburn is a devoted member of New Life Gahanna church, dedicating his time to the marriage and inner healing ministries. John is a proud graduate of Westerville South High School. After enlisting into the United States Army as a part of their infantry program, Wilburn went on to earn his Marketing and Business Management degree from Franklin University. John has 25 years of business management and marketing experience after initially pursuing a career in retail management. 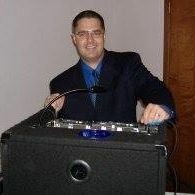 He later opened his own consulting and entertainment companies and has been performing and managing special events in the Columbus, Ohio area since 2001 as a DJ/MC/Coordinator and gaming specialist. John’s creative vision continuously leads the overall direction of the VIP Events Management team and brings creative marketing strategies, negotiating experience, dynamic presentation ability and relationship building skills. VIP Events Management and Ohio weddings, special events, and meetings can expect an exciting and prosperous future with John’s experience, capabilities, and direction!